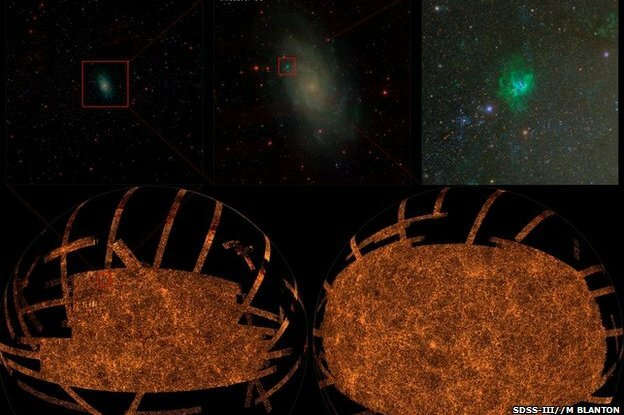 Scientists compile most detailed map ever of night sky | UNBELIEVABLE! Scientists working on SDSS (The Sloan Digital Sky Survey) have created the most detailed image ever of the night sky. It has taken over a decade of scanning the skies with a 138-megapixel camera to compile this image – consisting of over a trillion pixels in total. It is an image so detailed and so massive that it would take half a million high-definition televisions to take it all in at full resolution… And this is just a map of one-third of the sky! Posted on January 12, 2011, in Cosmology and tagged Size, Space, The night sky. Bookmark the permalink. Leave a comment.